It appeared that February was going to buck the downtrend that began in January when the first two days of the month produced impressive gains that left the Dow Jones Industrial Average almost 300 points above the emotional 10,0000 level. But Obama’s vow on Wednesday to crack down on big banks initiated a sell-off that continued into Thursday which culminated in a decline of 268 points, closing at 10,002. New banking proposals including the prohibition of commercial banks from engaging in proprietary trading combined with weak unemployment numbers and European sovereign debt problems increased the fear of investors leading to a reversal of the weeks early gains. The drubbing spilled over into Friday’s trading sinking more than 165 points before a last-minute rally leaving the Dow up 10 points. Today’s session failed to sustain the bullish rally with the Dow closing below 10,000 for the first time since November 9, 2009 at 9908, a decline of over 100 points. The S&P 500 also turned down with a close at 1056 but held support near 1050. Weekend news that Fed Chairman Bernanke will begin to layout his blueprint for tightening credit heightened the fears of traders adding fuel to the decline. Many analysts agree that if the 1050 support is breached in the next few days, we may be headed substantially lower. The American Association of Individual Investors weekly survey showed that less than 30% of those surveyed describe themselves as bullish on the market. This is the first time since November 2009 that the percentage of bulls fell below 30%. The percentage that describe themselves as bearish rose to 43%, also the highest since November 2009. Sentiment levels of this nature can often become buying opportunities. This can signal that most of the selling pressure has dissipated. Therefore, it may be too early to sell long positions. 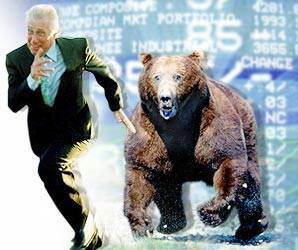 However, in this environment, it is prudent to hedge your long positions by selling calls or buying puts. If the S&P penetrates 1040, consider going to cash. This week’s earnings will include reports from Coca-Cola (KO), Walt Disney (DIS), Pulte Homes (PHM), Auto Nation (AN), Baidu (BIDU), and Pepsi (PEP). Our managed portfolios have held up well in the face of the dive below 10,000. We are still showing annualized returns of over 50%. You can learn more about our winning strategy of selling puts and calls by going to http://optionsprofitzone.com. Good news including Ford’s announcement of its first full-year profit since 2005, higher consumer confidence, and Apple’s new Ipad was not enough to offset higher than expected unemployment numbers, concern about slower growth in China and economic woes in Greece. January’s poor showing may not bode well for the rest of the year. Historical data seems to indicate that January sets the tone for the next 12 months. It will be interesting to see if the Dow can hold above the emotional 10,000 support level. If not, we could soon test the primary support at 9,000. Marc Faber, famed contrarian investment analyst known as Dr. Doom, has recommended pulling your money out of stocks right now, predicting that the S&P 500 could fall as much as 20% to 920. He believes that stocks are expensive due to the absence of a meaningful economic recovery. ” With unemployment staying at a relatively high level and with the revenue being weak, I don’t think corporate profits will be that great in 2010,” Faber said. “Basically, the profits have been boosted by aggressive cost-cutting. The revenue side of corporations is weak.” Faber advised investors to buy U.S. stocks on March 9, 2009 when the S&P reached its lowest level since 1996. The coming week’s calendar is busy right out of the gate starting with Monday’s economic data, which will include December’s personal income and spending, December’s construction spending and the January Institute for Supply Management manufacturing index. The day will also see earnings releases from Exxon (XOM). January’s auto sales and December’s pending home sales are due on Tuesday, along with earnings from BP plc (BP), United Parcel Services (UPS), Whirlpool (WHR), and News Corp (NWS). Wednesday will bring the January ADP employment report, the ISM services index, and weekly crude inventories. It will also be a big day for earnings with Comcast Corp. (CMCSA), Pfizer Inc. (PFE), Time Warner Inc. (TWX), Broadcom Corp. (BRCM), Cisco Systems Inc. (CSCO), Visa Inc. (V), and YUM! Brands Inc. (YUM) reporting. The fourth-quarter productivity report, and December’s factory orders are scheduled for Thursday with earnings reports from Burger King Holdings Inc. (BKC), The Clorox Co. (CLX), Kellogg Co. (K), MasterCard Inc. (MA), and Sony Corp. (SNE). We’ll end the week with more corporate earnings and January’s unemployment rate, nonfarm payrolls, and December’s consumer credit report due on Friday. The numbers for our managed portfolios are still being calculated, though I’m sure in light of the market’s performance we will have lost some ground. I expect that our hedged portfolio fared the best, as it should in the environment we are experiencing. I’ll post them when they are available. In the meantime, keep your eye on the volatility index (VIX) for clues as to the market’s conviction. “Earning reports failed to provide much lift, the Chinese are threatening to tighten lending policies, jobless and housing figures disappointed, and the banking sector is worried about President Obama’s financial reforms.” This quote from a Schaeffer’s Investment Research commentary sums up the conditions for last week’s perfect storm that left in its wake the worst week in nearly a year for the Dow Jones Industrial Average, effectively wiping out 2010’s gains. After positive gains on Monday and Tuesday, the markets were slammed on Wednesday due to renewed economic concerns highlighted by China’s bank regulator, who repeatedly requested that several banks stop issuing loans. His actions suggested that the global credit markets are rapidly tightening which could be the first sign of a reversal of the recent economic optimism. IBM’s forecast for slower earnings growth in 2010 and bearish reports from American Express and Google added to the rising swell of concern. Capping off the wave of discontent was Obama’s announcement of his intent to limit investment activities permitted by banks in what some see as a return to Glass-Steagall style regulation. This caused investors to flee financial stocks, leading the markets into a deeper decline. By the end of the week, the Dow was down 4.1%, the S&P had shed 3.9% and the NASDAQ had lost 3.6%. A correction should have been seen on the horizon due to the fact that the major indexes had approached major resistence levels in previous weeks. The Dow may be headed for a test of support at 10,000, with downside penetration suggesting a target of 9000. A recovery above 10,500 would indicate a resumption of the primary advance. Respecting support of 1080 on the S&P would be a bullish indicator for the short-term trend of the general market. Recent patterns would suggest positive gains on Monday but negative economic news combined with poor earnings reports could cause the markets to take on more water and sinking to lower levels. Monday, traders will be looking to reports from Apple (AAPL) who is expected to report earnings of $2.08 per share, above last year’s profit of $1.78. Reports show that despite its solid fundamental history, option traders are betting heavily against Apple. However, it’s common shares were up over $5 at this writing. As corporate earnings take to the high seas this week, Texas Instruments (TXN), DuPont (DD), Verizon (VZ), Johnson & Johnson (JNJ), Yahoo (YHOO), 3M (MMM), Amazon (AMZN), and Microsoft (MSFT) are among the many companies expected to report. Monday and Tuesday, December’s existing home sales and January’s consumer confidence index will be released. The Fed’s decision on U.S. monetary policy will be announced on Wednesday, along with December’s new home sales and weekly petroleum supplies. Friday ends the week with advance fourth-quarter gross domestic product (GDP), the January Chicago purchasing managers’ index (PMI), and the January University of Michigan consumer sentiment index. Our managed portfolios have lost some ground due to the market declines, but are still showing tremendous returns on an annual basis. We ended the week at $1,420,209 and $1,548,488, respectively. Stocks recovered nicely from Tuesday’s negative response to lower than expected earnings from Alcoa and Chevron’s warning of expected shortfalls with a 53 point climb to a new 15 month high. After a mid-morning sell-off the blue chip index turned sharply after investors considered the testimony of several top banking executives on Capital Hill which included the CEO’s of Goldman Sachs and JP Morgan. The Dowe topped the 10,700 market since September 2008. Merk led the pack after an upgrade by Credit Suisse who moved its target price from $35 to $47 per share. The S&P followed with a gain of 9.5 points to close at 1145 within reach of its 1157 resistence while the NASDAQ broke above its 10-day moving average closing at 2307. All eyes are on Intel’s earnings report on Thursday for clues as to the strength of the economic recovery. A positive Intel number may be just what the Bulls need to move this market through near term resistence. Crude oil dropped for the third consecutive day reversing a month-long uptrend after stockpiles of crude and gasoline grew by more than analysts predicted suggesting that consumer demand remains weak. Gold moved higher in response to a weaker dollar to close at $1136.80 per ounce, a gain of $7.40. As promised, I am posting Friday’s closing values for our managed portfolios which came in at $1,452,645 and $1,602,701 for our hedged and unhedged portfolios. This represented a gain of $12,448 and 24,659, respectively. For more info go to http://optionsprofitzone.com. Stocks celebrated the New Year by posting a 1.5% gain on its first day of trading before settling in for the rest of the week, ending Friday only 35 points higher than the Monday close. The Dow Jones Industrial Average finished the week at 10,618, well over the 10,500 resistence level which was penetrated on December 14 with the S&P settling above its resistence of around 1120 with a close of 1144. Encouraging words from the Fed and Treasury regarding keeping interest rates low offered traders reason to remain optimistic which led to Monday’s impressive move which broke through muti-month highs. Even Friday’s disappointing December unemployment number couldn’t hold back the charging bulls. Potential resistance for the S&P 500 is at 1,157.80 with major resistance at 1300. The first sign of resistence for the Dow Jones Industrials is at 11,000. The Financial sector looks to improve in 2010 after rallying 6% for the week pushing through stiff resistance. Technology stocks continue to dominate Wall Street evidenced by the Nasdaq soaring 2.1% for the week. The Internet sector remains one of the strongest with the Internet HOLDRS Trust (HHH) gaining more than 69% during the past 52 weeks. Fourth quarter earnings will take the stage in the coming week with Alcoa (AA) reporting on Monday. Additional earnings from KB Home (KBH), Intel (INTC), and J P Morgan will be reported throughout the week. Economic news will include December retail sales on Thursday with Friday reporting the December CPI, capacity utilization and industrial production, the Empire State manufacturing index and Michigan’s consumer sentiment index. The data from our managed portfolios was not available when I penned this commentary. I will post it when I get it. In the meantime, Happy trading. All three major market indexes closed the short holiday week at their highest levels of 2009. The Dow managed to crack the 10,500 level, though volume was on light, leaving the true conviction of the move in question. Nevertheless, the market finished the week in positive territory, delivering joy to investors ahead of the holiday weekend. Healthcare stocks surged early in the week after the Senate made strides in passing the long-awaited health care reform bill which is seen as favorable to health care and drug companies. The strongest month-over-month existing home sales pushed the markets higher on Tuesday due to a surge in first-time buyers taking advantage of the federal tax credit, though momentum was tempered by a revised third quarter GDP which was cut to an annual rate of 2.2%. New home sales disappointed the markets on Wednesday but a rebound in commodities and earnings from Micron (MU) and Red Hat (RHAT) helped lift the NASDAQ and the DOW into the black by the close. Favorable unemployment reports helped the DOW and S&P break through resistence levels on Thursday, closing the week on a festive note on Christmas Eve. Heading into the last week of trading in 2009, expect continued light volume. No major economic news or earnings announcements are scheduled. 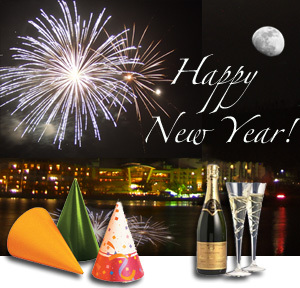 The markets will be closed on Friday for New Years Day. Our hedged portfolio lost a little ground closing the week at $1,433,104. Our other portfolio fared better, closing at $1,568,441. Thanks to positive earnings announcements from Oracle (ORCL) and Research in Motion (RIMM), tech stocks including Intel and Microsoft were broadly higher on Friday helping the Dow Jones Industrial Average to erase the red ink it had displayed for much of the day, closing with a gain of 20 points. Earlier news from Boeing (BA) regarding the loss of a 200 aircraft order form Irish airline Ryanair had led the Blue Chips to a 45 point deficit before Santa brought the good news to tech investors. With only a few days left before Christmas, investors may not find much more under the tree, however, most are celebrating a 22 percent gain for 2009, after facing one of the steepest first quarter market declines in many years. 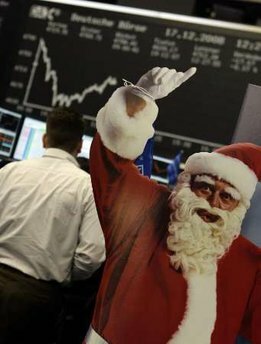 Markets often experience a Santa Claus rally in the final days of December, but the 63 percent gain from the March lows experienced by the S&P 500 may be considered by most the ultimate gift of the season. The Dow’s resistence at 10,500 has proven to be a difficult ceiling to break through, as does the 1120 level for the S&P. 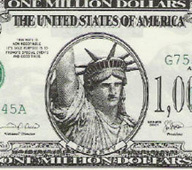 The dollar, however, continued its rally bringing cheer to investors holding hope for a strong economic recovery. This has been a key factor holding equities to a narrow trading range and below technical resistence levels. Despite the dollars strength, gold moved higher on Friday after a sharp pullback on Thursday ending the week with a 0.01 percent gain. Crude oil moved higher on Friday in response to geopolitical tension between Iraq and Iran, after Iranian forces crossed in to Iraq to seize control of a disputed oilfield. Though Iraq sent troops to the area, a diplomatic solution is the likely outcome. I get the sense that this will end peacefully next week. As holiday shopping draws to a close, light volume and year-end window dressing will probably cause volatility to rise through the end of the year. Portfolio managers will be selling weak holdings in favor of its stronger positions, in order to close out the year on a joyous note. This could lift stocks that have done well this year to even higher levels at the expense of the year’s under-performers. Reuter’s reports that this week’s major economic indicators will include consumer sentiment, personal spending and the latest weekly claims. On Tuesday, the gross domestic product report is expected to show the U.S. economy expanded at an annual rate of 2.8 percent in the third quarter, in line with the previous reading. Existing home sales for November also will be released on Tuesday, with economists forecasting sales will rise to a seasonally adjusted annual pace of 6.25 million units from 6.10 million in October. On Wednesday, new home sales for November are expected to edge up to a seasonally adjusted annual rate of 440,000 units from 430,000 in October.On Thursday, the New York Stock Exchange trading floor will close early in observance of Christmas Eve. The gifts continue to pile up under the tree for our managed portfolios with the hedged account closing Friday at $1,445,260 and the newer unhedged account coming in at $1,572,460. For your free gift video, go to http://optionsprofitzone.com. Recent strength in the dollar has proven to be the single biggest factor driving both equity and commodity markets and may hold the key to stock market performance for 2010 . An environment where the dollar continues to move higher will push commodity prices lower and will cause last week’s blog, “Stuck in the Middle With You”, to be a best case scenario for equity prices as long as monetary policy remains indusive. Stocks and commodities have traded in inverse directions for much of the last 10 months, however, strong retail sales and consumer sentiment pushed stocks and the dollar higher together on Friday. This correlation may be the first sign that the dollar is reversing to the upside after forming a double bottom in the last 3 weeks. Rising interest rates in response to a strong dollar would likely be negative for stocks, as investors would sell stocks in search of higher yield and lower risk. Gold and oil lost ground last week as the dollar gained momentum. Friday marked the eighth straight day of declining oil futures, settling in at a two month low while gold futures searched for support at $1100. Failure of the 1100 support level would cause gold to look for secondary support at 1000. Respect of 1100 may signal an advance to 1300, but only if the dollar weakens. As the U.S. Dollar Index tests resistence at 76.5, some technical analysts point out that the last time resistence was tested, the dollar reversed downward to hit new lows over the next month. A breakout above 76.5 would be a bullish signal for the dollar and may trigger weakness in stocks. The S&P and the Dow are both facing resistence levels, as well, at 1120 and 10,500 respectively, which can also spell trouble for equities. Portfolio managers continue to be cautious at these levels until a breakout in either direction is apparent. Keep your eye on the dollar for clues as to how this will play out. The coming week’s most notable economic news will be on Wednesday when the Federal Open Market Comitte (FOMC) releases its decision on monetary policy. Also announced during the week will be December’s Empire State manufacturing index, November’s capacity utilization and industrial reports and November’s leading economic indicators. Earnings from Best Buy(BBY) and Adobe Systems (ADBE) a due on Tuesday with Fedex (FDX), Discover (DFS), Nike (NKE), Oracle (ORCL) and Research In Motion (RIMM) reporting on Thursday. In the meantime, our managed portfolios continue to climb with our hedged account closing at $1,425,871 and our unhedged account finishing Friday at $1,536,333. 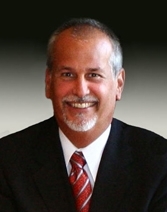 We’ve just posted a new video interview with Sam Newman, co-author of “Winning the Race to Financial Independence” and the Options Profit Zone Home Study Course on our website at http://optionsprofitzone.com. Just click on the box near the bottom left of the page to see it.